The responsibilities of a corporate governance professional are wide-ranging. The CCH Corporate Governance Guide (formerly the Corporate Secretary's Guide) provides a comprehensive resource for this multifaceted function, giving you all you need to stay current on ever-changing regulations and requirements and get the job done better and faster. As a result of changes in the corporate governance arena, the Corporate Governance Guide was recently fine-tuned to more accurately reflect the current role of the corporate governance professional. The two-volume guide is a comprehensive resource, published in consultation with the Society of Corporate Secretaries & Governance Professionals, covering state corporation law, federal securities law, SEC regulations, and selected court decisions. The CCH Corporate Governance Guide offers detailed discussion and analysis of a wide range of corporate governance topics, including: boards of directors, executive compensation, proxies, meetings and elections, fiduciary duties, periodic reports, individual liabilities, insider transactions, SEC practice and enforcement, mergers and acquisitions, and international considerations. Another key feature is the state business law summaries for all 50 states, the District of Columbia and Puerto Rico, organized by topic and state to facilitate comparison of the law across multiple jurisdictions. In addition, the guide reproduces the full text of selected SEC regulations (e.g., S-K, S-T) and forms (e.g., 8-K, 10-K, 14A), as well as sample corporate forms and clauses (e.g., board resolutions, proxy proposals, sample SEC filings). The Internet version of the Corporate Governance Guide now contains, at no additional charge to subscribers, the Corporate Governance Guide State Law Summaries Smart Chart which allows you to research and compare corporation law topics across jurisdictions. Among the topics covered are incorporation, shareholders, directors and officers and books and records. Search results are displayed in an easy-to-use chart that also includes a link to the information in the Corporate Governance Guide . Get the information you need the most, quickly and easily - Published in consultation with the Society of Corporate Secretaries & Governance Professionals, to ensure it provides the information corporate secretaries and other governance professionals need the most, the Guide is indexed by both topic and state in a simple format that allows you to easily locate specifically what you’re looking for. 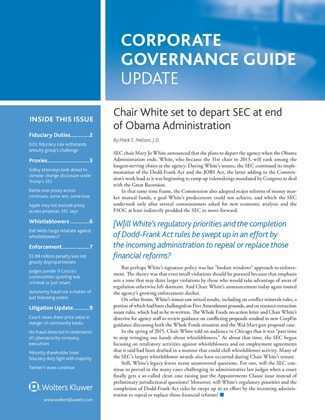 Stay up to date with the Corporate Governance Guide Update newsletter - The semi-monthly Corporate Governance Guide Update newsletter supplements regular monthly reporting with updates on a broad range of topics: recent Delaware court decisions, SEC rulemaking and enforcement, state and federal legislative developments, accounting issues, and international news. The new name, along with changes to the newsletter format and layout, signals corresponding enhancements to the content and scope of coverage. The database includes archival issues back to January 1995. Note: Online subscriptions are for a three-month period.